Gov. Snyder answers questions from reporters on Monday about his plan to rescue Detroit Public Schools. The governor will likely have to battle local control concerns, "bailout fatigue" to convince state lawmakers to approve the plan. Gov. Rick Snyder wants the Legislature to adopt an expensive, controversial plan to overhaul Detroit’s schools by the end of the year. Snyder outlined his plan in Detroit on Monday. 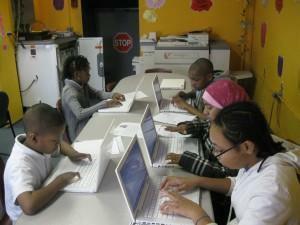 The goal is to rescue Detroit Public Schools from crushing debt and dismal academic results. The proposal would split the district in two. A new body would oversee education and normal school operations. The old DPS would exist only to collect taxes and pay down debt. But the governor faces what could be the toughest sales job of his tenure to try to win legislative support for the plan. The plan would cost the state $715 million dollars over 10 years. But Snyder says the alternative could be even more expensive. That’s because the state has to pick up the tab if the district defaults. 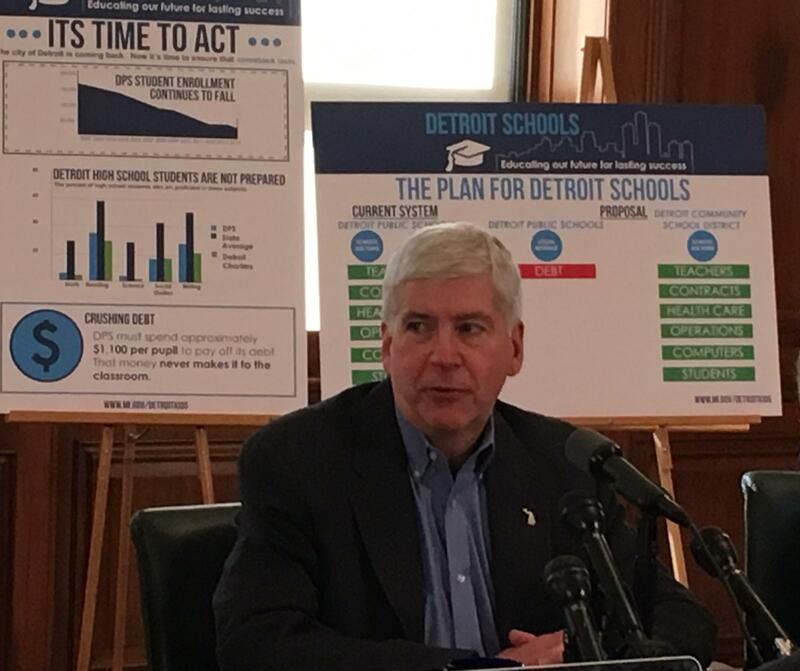 “Either the school districts themselves or the State of Michigan and the taxpayers are going to pay much more in liabilities than coming up with a smart solution to a very difficult situation, which is what we are proposing in this particular case,” Snyder told reporters during a roundtable discussion in his Detroit office. One big question is whether out-state lawmakers would be willing to go home and tell their local school officials they’ve sent money to Detroit schools that would have otherwise gone to them. Snyder’s plan would tap the state’s School Aid Fund as part of the arrangement to pay down DPS’ $515 million debt. “Are the additional revenues coming as a result of reducing revenues to all other students across Michigan? That’s the question I have,” said Saginaw Intermediate School District Superintendent Kathy Stewart. The Republican-led Legislature already agreed last year to send money to the city of Detroit to help it emerge from bankruptcy. It’s also just coming off of a vote to send money to Flint to help address the city’s water contamination crisis. There’s reason to believe lawmakers have bailout fatigue. But it’s not just Republicans and out-state public officials who question the governor’s plan. Detroit lawmakers have also offered harsh reviews. They oppose the proposal as written, in part because the new school district would initially be overseen by an appointed panel. “We believe in a democratic society and we believe in democracy. And the voters of the city of Detroit have spoken and they’ve elected a school board. And we want our school board to be empowered,” said state Rep. Brian Banks, D-Detroit, who chairs the House Detroit caucus. Banks says Detroit lawmakers don’t want to go home and try to explain why they voted for a plan that does not restore local control over Detroit schools. “Because the same people that elected the school board are the same ones who elected us,” he said. Gov. Snyder is also trying to sell his plan under the shadow of an FBI corruption investigation into officials with DPS and the Education Achievement Authority. 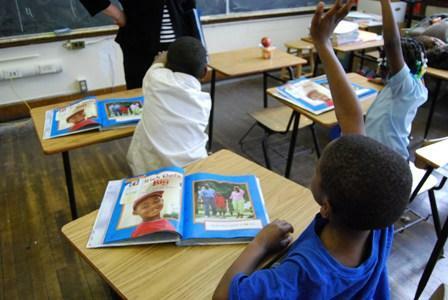 The EAA is Snyder’s school turnaround district which oversees 15 of the lowest-performing schools in Detroit. The governor admits that investigation won’t help him when trying to convince lawmakers to support his newest plan to turn around Detroit schools. “I think it’s fair to say it complicates it,” Snyder said. But he says lawmakers who patted themselves on the back last year after approving the “grand bargain” to help Detroit emerge from bankruptcy need to understand that success doesn’t mean much if they don’t also step up to help the city’s schools. The state has been operating Detroit’s schools under some version of a takeover for the past six years. And Snyder has to convince Republicans and Democrats that this newest state intervention will be an improvement over what’s already been tried. Gov. Snyder's plan would split the current school district in two. Similar to the GM bankruptcy, there would essentially be an "old" Detroit Public Schools district and a new district. The old district would pay down the school system's debt with the current school millage in Detroit. Snyder says DPS is expected to have $515 million in operating debt by June 2016. Snyder says that debt could be paid off over 10 years using the $70 million a year the millage brings in. 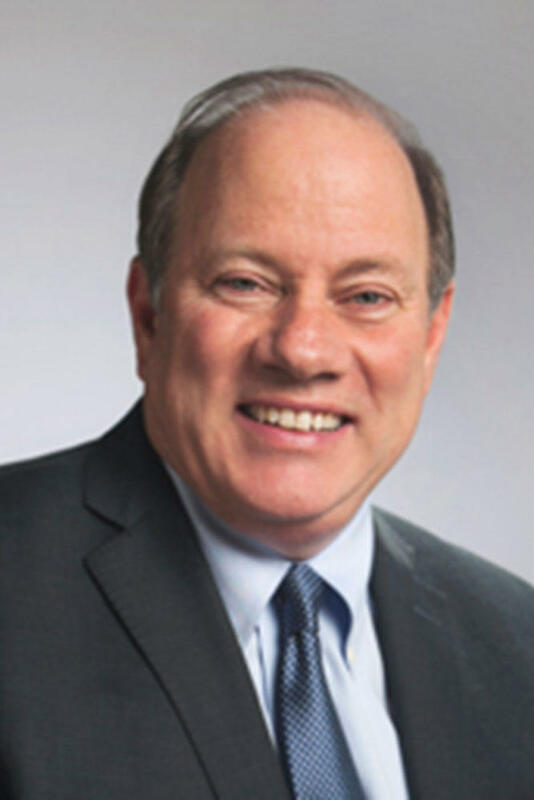 As Lansing gears up to debate a radical reorganization of Detroit schools, Mayor Mike Duggan is pushing for a larger role in the city’s future education system. Duggan outlined his vision for a complete education overhaul earlier this year. It shares the same basic structure as Gov. Snyder’s proposal for Detroit schools, but differs on a few key points. Both call for a bankruptcy-style restructuring — without the actual bankruptcy filing — that would split the Detroit Public Schools into “old” and “new” districts. Governor Snyder says plans to overhaul Detroit’s education system should get moving in Lansing soon. It’s not clear exactly what will be in those bills. But in the past, Snyder has floated a bankruptcy-style plan for the debt-ridden Detroit Public Schools. The Detroit Public Schools is in even bigger financial trouble than previously thought, according to a state report filed this week. In its June 2015 quarterly report on school district deficits, the Michigan Department of Education pegged DPS’s annual budget deficit at $166,359,414.